The Gauley River NRA (National Recreation Area) is an awesome wild river experience, and you don’t have to be in a raft or kayak to enjoy it. There are a fair bunch of waterfalls in this area. We weren’t able to get to all of them, and some I have no clue as to their names, if any, but we were able to finally find the chief objects of our adventure. Confluence Falls, which is on private property, as well as Peter’s Creek Falls. Both falls required work to get to, with Confluence being the more difficult. We begin our day by traveling Sunday Rd. Strangely, our first surprising view, other than the beautiful countryside, was of a Moai figure which someone had carved. I didn’t expect that at all. Kind of cool though. It will be uphill on your left up someone’s driveway as you turn right onto Wood’s Ferry Crossing. The adventure up river from the actual crossing area led us to a number of roadside waterfalls, some more spectacular than others, but all were nice and roadside. The main difficulty with driving this road is it’s unpredictability. However, people drive school buses down here, so, I figured I could drive my pick up. It’s an old railroad grade that runs along the south bank of the Gauley River. From the crossing, it’s about 8 miles to the end where you will have to turn around at an old tunnel which has been closed to through traffic by the park authorities. It does look rather dubious. It’s starting to cave in in places. I was disappointed because I had planned to drive a lot longer along the river. The first stop was just at the bottom of the nasty road to Wood’s Ferry. Ramsey Branch is worth whatever effort you have to put into seeing it. A very special place. Here some photos of the other falls we saw on the south bank. One thing I will say about this trip is, if you don’t want your paint scratched up, don’t go down this rail grade. It’s narrow and lots of things grow out into the road. You may also find a tree fallen across the road, as we did, or a rock slide here and there, as we did. My truck took a bit of a beating, I’d have to say. However, even the thought of a new paint job was palatable after I witnessed Confluence Falls. This is a hard hike and not really obvious. There is no trail. You have to bushwhack up the creek and it’s not the easiest. It can be somewhat trecherous actually. My friend Jim, fell hip deep into a rock crevice that was covered by innocent looking level forest floor. Unfortunately, it was just a lot of rotten sticks and leaves covering a crevasse. He’s OK and glad he made the trip. Here’s the 70′ tall Confluence Falls. Visit the page. There is more to the east of Woods Ferry Crossing, such as Laurel Creek and Sugar Creek. 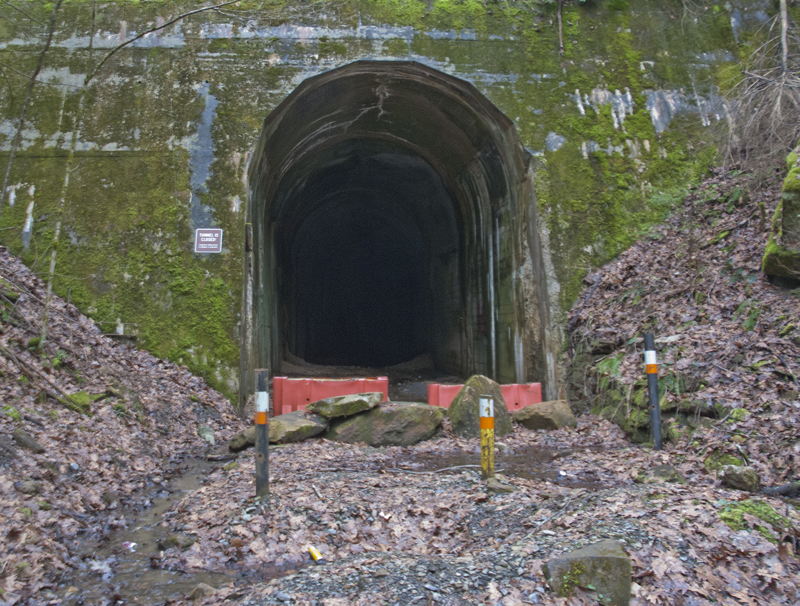 I’m not confident of driving the railroad grade in that direction, in fact I’ve been told that the authorities don’t want anyone driving it, but I know you can walk it up to and through the tunnel and cross the river on the railroad trestle over to Peter’s Creek Falls. But there are easier ways to get there. Here’s a link to Laurel Creek. As for Sugar Creek, there is Sugar Creek Rd. but I have not been there yet.